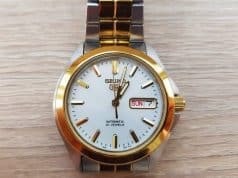 We’re reviewing the Seiko 5 SNKK17K1 automatic. Another day, another Seiko watch, but this time around we’re focusing on one of the more stylish versions of the Seiko 5, namely the SNKK17K1 Automatic. This is a 2017 watch model that doesn’t cost more than $140, which is incredible when you consider how much it has to offer. 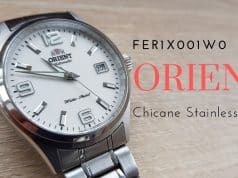 It’s a stylish watch, albeit not the manliest due to its relatively small case, and it provides a perfect blend of reliability and accuracy. 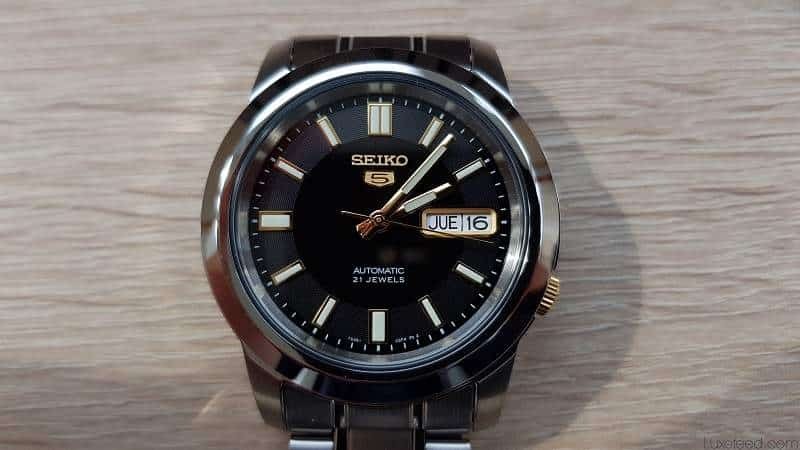 Even though we already reviewed a Seiko 5 beforehand, this one is slightly different due to its recessed crown and unique colorway. 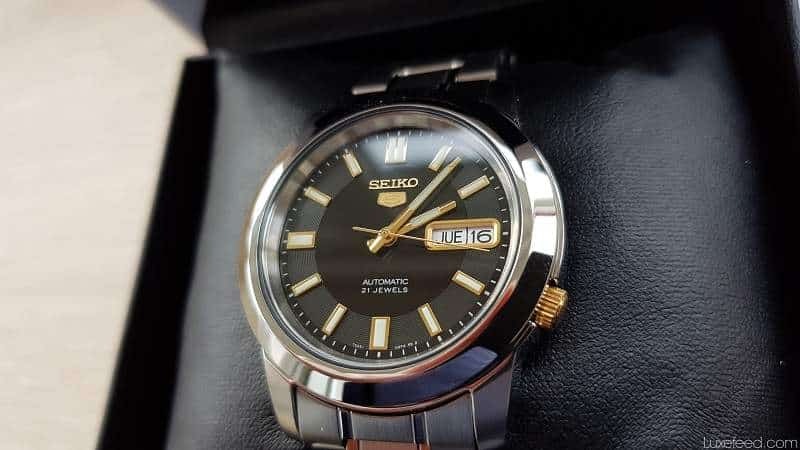 There are countless variants of the Seiko 5 available right now, and many more will likely surface in the following years, as the Japanese company has struck gold with this affordable automatic. 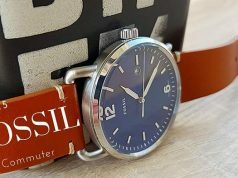 It can’t even be referred to as an “entry-level” automatic watch anymore, as it gets the job done just as well as a more expensive offering. Its power reserve is good enough, its case is sturdy enough, and its looks are pleasing enough to make it a no-brainer for anyone willing to enter the automatic watchmaking segment in style. 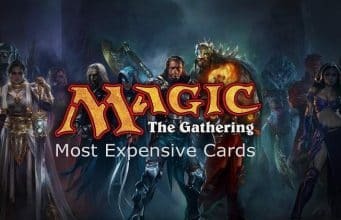 But I’m not the one to praise without proof, so let’s take a closer look at the SNKK17K1 and see what it has to offer! 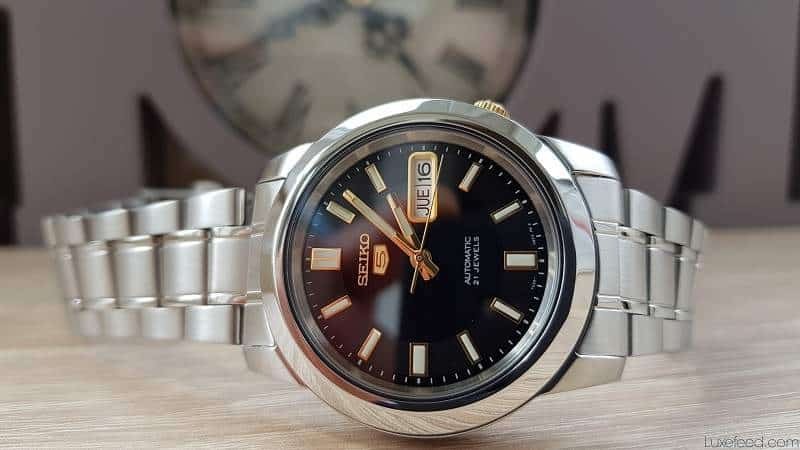 The case of the Seiko 5 SNKK17K1 was created using stainless steel, and as I mentioned before, it’s definitely on the smaller side. It measures in at 39mm according to Amazon, while other retailers claim that it’s actually a 38mm case. I’m more inclined to go with the 38mm variant, and a quick personal measurement seems to confirm this size as well. It’s not a large watch but it’s not lady’s watch territory either. Not even close. I’m guessing Seiko went with this particular case size in order to appeal to a wider audience. While I usually prefer my watches to measure at least 40mm, the overall design of this piece makes me forget all about its measurements. Speaking of which, I definitely like the elegant black dial, as well as the gold hour markers and hands that provide a great contrast. The date window also has a gold frame, which I think is a nice touch. The bezel boasts a highly reflective steel look. 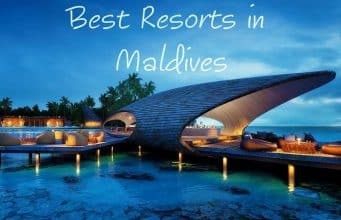 It looks beautiful but serves no mechanical purpose, which is to be expected. 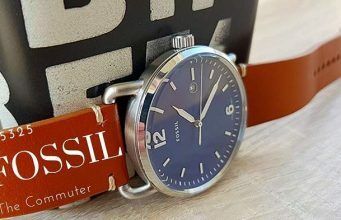 It’s worth noting that the strap features a brushed steel finish, which creates a distinct visual barrier as it meets the case. As with most Seiko 5 watches, the dial is protected by a Hardlex crystal, which is also present on the back of the exhibition case. The case offers a water resistance of 3 ATM, which translates to 30 meters or 98 feet. As usual, I wouldn’t advise you to shower or swim while wearing this watch, but light splashes probably won’t harm it at all. At the rear, the in-house Japanese 7S26C automatic movement can be admired partially. The exhibition window is quite generous, and it allows a clear view of the components of this complex and highly reliable calibre. 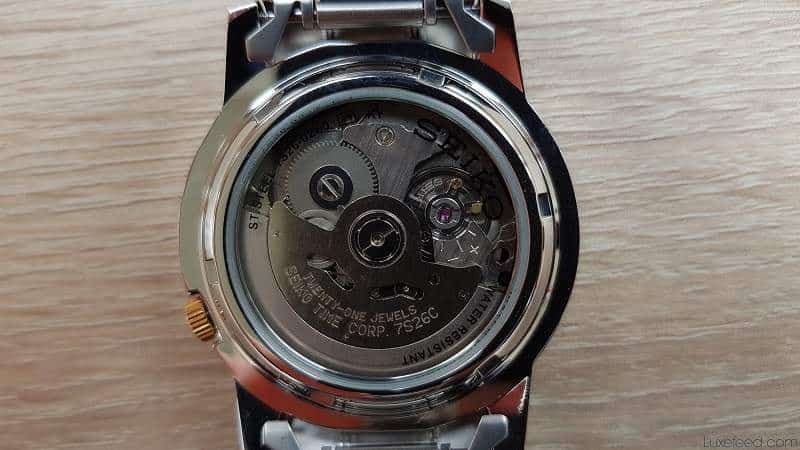 There are several inscriptions on the case back, including the movement serial number, the water resistance rating, as well as the watch’s model. 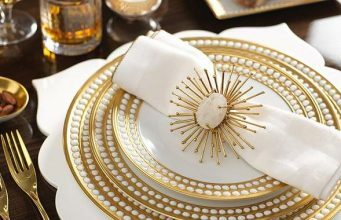 As for the crown, it boasts a beautiful gold finish, and it sits recessed at the 4 o’clock mark. It doesn’t offer any manual winding capabilities, though, which is a bit of a drawback. 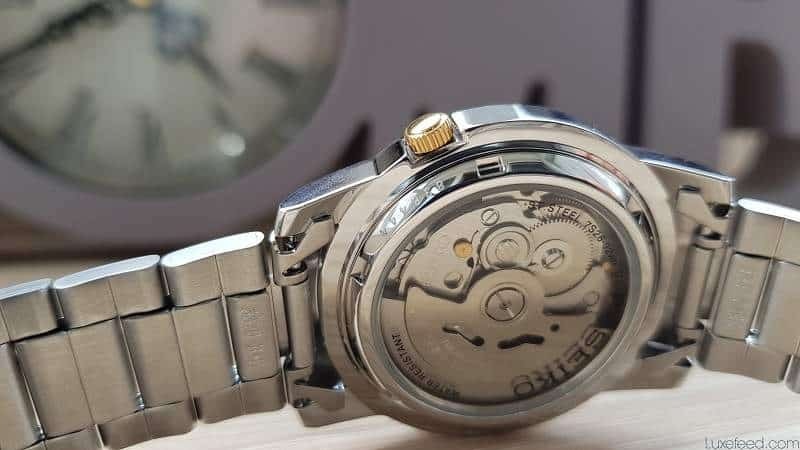 However, those of you who are already familiar with Seiko 5s will know that they wind up automatically using the momentum generated by the wearer’s wrist. As long as you wear this watch on a daily basis, you won’t have to worry about running out of power. The dial is black, which is a perk in its own right, but the contrast created between this black look and the gold hour markers is the true feature here. The hands boast a gold look as well, and they come with a luminescent treatment that enhances visibility in low light conditions. The Luminova, also present on the bar-shaped hour markers, doesn’t light up more than a minute in complete darkness, but that’s enough time to get a good glance at the watch after leaving a bright environment. 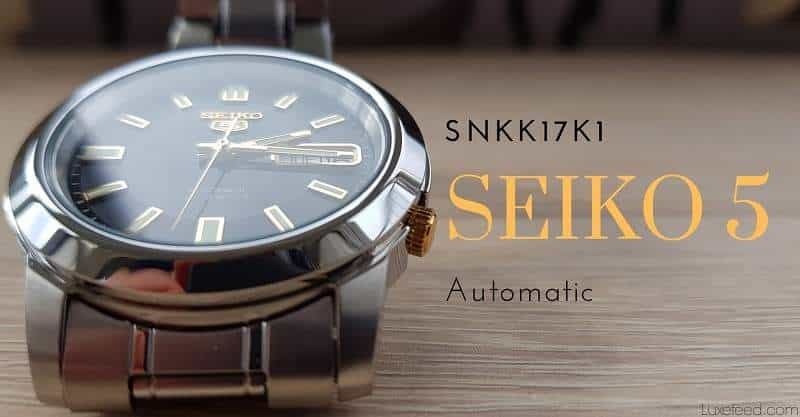 Underneath the 12 o’clock mark, Seiko has placed their own logo, while the “Automatic 21 Jewels” statement rests above the 6 o’clock mark. Overall, this is one of the most readable dials I’ve seen on an automatic watch so far. It’s simple, highly functional, and a pleasure to look at. The movement inside the SNKK17K1 is the now-famous Japanese 7S26C, which powers a generous number of Seiko watches. 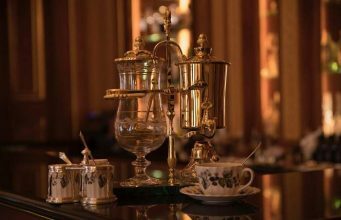 It boasts a power reserve of 40 hours, it includes 21 jewels in its construction, and it operates at a frequency of 3Hz or 21,600vph. While not entirely as accurate as a high-end quartz movement, the 7S26 could have a variance of 20/+40 seconds per day. That’s not exactly something to brag about, but it’s also easily fixed with a few adjustments every other week. Originally introduced back in 1996, this is one of the most praised movements on the market, especially at its price point. 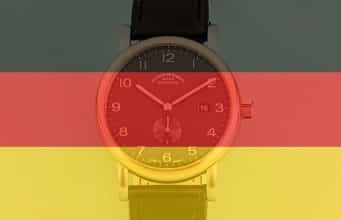 It operates at temperatures between -10 ºC and 60 ºC (Between 14 ºF and 140 ºF), and it’s a solid and dependable movement that will keep the watch alive for years, even decades if cared for properly. 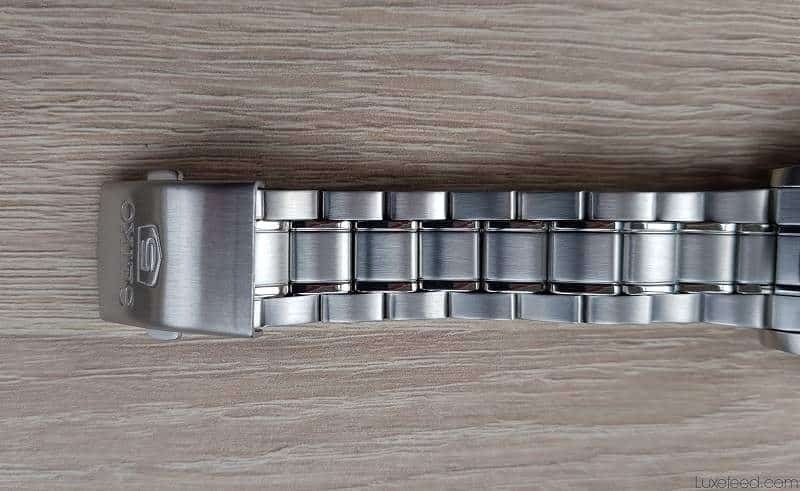 Yes, just like the previous Seiko watch that we reviewed, this one comes with a rather disappointing bracelet. I’ve said it before and I’ll say it again: it’s not a bad bracelet by any means, but its construction does give off an air of cheapness. It was created using folded stainless steel links, and it does look decent enough without spoiling the aesthetics of the watch itself. 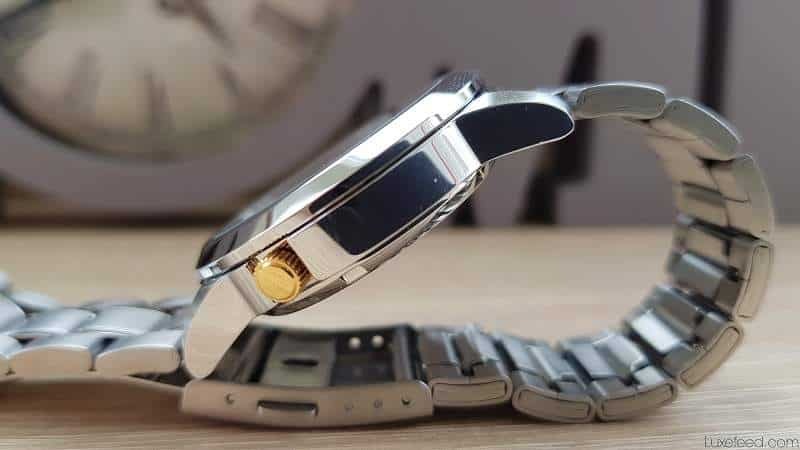 The clasp has a push-down system that allows the wearer to remove the watch easily. There’s also a Seiko 5 engraving on this clasp for an extra touch of authenticity. You could replace this 22mm bracelet with a leather strap, true, but this might bring up the total price of the watch considerably. The bracelet is comfortable enough, and it will get the job done for years to come. It’s likely to accumulate some scratches over time, but that’s to be expected. 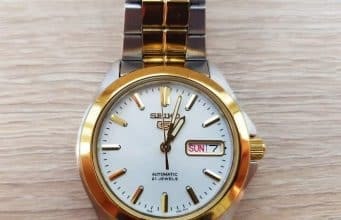 Final thoughts about the Seiko 5 SNKK17K1 Automatic watch. It’s hard to find a Seiko 5 that doesn’t look good and performs admirably. 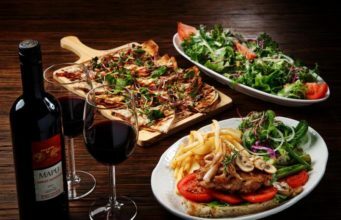 At the end of the day, your own taste will be the deciding factor when you pull out your wallet or credit card. The SNKK17 model stands out due to its black dial and gold markers, but apart from that, it does everything that you would expect it to do. It keeps time with decent accuracy, and it doesn’t weigh too much to become uncomfortable during prolonged wear. The bracelet is a bit of a letdown, sure, but it can be replaced without too much difficulty. You can find this watch for less than $100 at various retailers, including Amazon, and for that kind of money, you couldn’t really ask for a better timepiece.